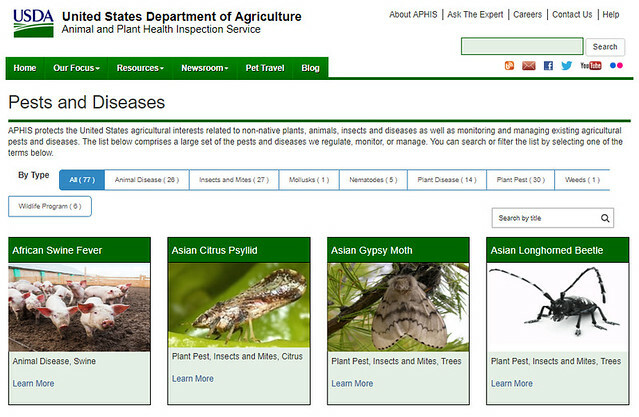 The new Pests & Diseases web page provides easy access to information on APHIS’ pest and disease programs. APHIS and its state and industry partners continue to fight to protect agriculture against so many different pests and diseases. The variety and impacts are constantly growing. This new web page will make it easier for people to find information and provides a one-stop shop for all of APHIS’ pest and disease programs. Whether it’s citrus greening, avian influenza, feral swine, Asian long-horned beetles or some other pest or disease that interests you, this web page will help you find and explore the most current news and information.